Adblocking is a necessity these days, with more and more sites and applications throwing intrusive ads and popup ads into the users face, every day. The ads not only annoy the users but also slow down the loading times considerably since the site itself needs to make a lot of request to 3rd party ad providers. That's unacceptable but luckily, software applications such as Adguard are a must, these days. Adguard provides a very smooth browsing experience by removing all the annoying ads, which in turn, lowers your bandwidth usage and your overall enjoyment. 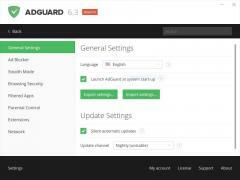 Adguard also blocks malicious scripts and different types of malware, for your continuous safety. The application has overwhelming support for all the major browsers including Internet Explorer, Mozilla Firefox, Safari, Google Chrome, Opera, Maxthon, as well as smaller ones in popularity such as Avant, Flock, SRWare Iron, Lunascape, K-Meleon, GreenBrowser, or Pale Moon. The ad blocker is easily configurable and provides a sleuth of features and customizations. You can add different URL exceptions as well as block everything that's thrown at you. Adguard also blocks all the major analytics scripts that are present on every site and keeps your browsing experience as anonymous as it gets. Adguard is highly praised by its community and in our tests, with some exceptions, it came in top 3 in speed, ads blocked and reliability. If you value your privacy and want to have a smooth browsing experience, Adguard is one of the best ad blockers right now.